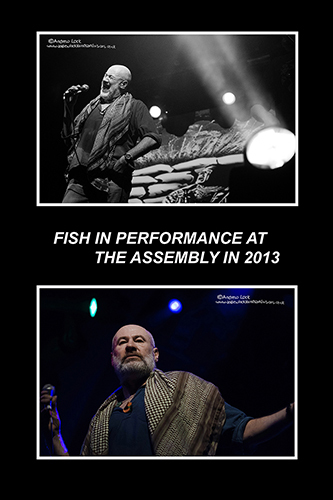 A must see this one as Fish returns to town to celebrate both the 30th anniversary of his final (and absolute masterpiece) album with Marillion Clutching At Straws and the release of his final solo studio album Weltschmerz. He has been no stranger to the venue staging two of his fan club conventions there in 2009 and 2012 as well as choosing the Assembly for a showpiece leg on the tour for his last studio album A Feast Of Consequences in 2013. One of rocks greatest showmen and a masterful story teller he still has such a powerful singing voice (he just changes the key on some Marillion numbers) to go with his ever present charisma and stage craft and attracts musicians of the highest calibre to perform alongside him. This could be one of the last chances to see this amazing artist perform on local turf as he plans to start a retirement tour next year and I so highly recommend this show which will surely be a night not to forget. The photos above are from his last Assembly visit in 2013.